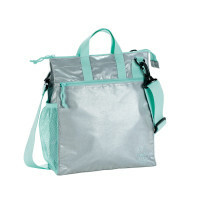 The Casual Buggy Bag Full Reflective is a simple and stylish companion that reflects when light hits it to ensure special safety of mother and child. 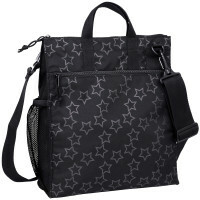 Product information "Buggy Bag , Full Reflective"
description & equipment The Casual Buggy Bag Reflective Star is a simple and stylish companion by day that keeps a surprise on hand for the evening hours. 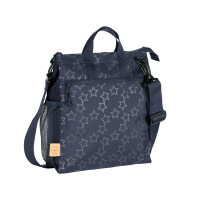 This is because the bags are equipped with an inconspicuous star design that reflects when light hits it. The sparkling stars thus ensure the special safety of mother and child, because they are better seen by other road users in twilight and darkness. The bag can be carried by the loops in the hand, can casually be carried over the shoulder with the height-adjustable strap or else attach to the stroller using the snap hook and Velcro band tape. 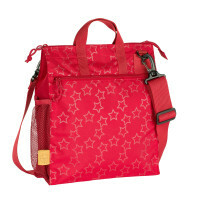 With its large main compartment and a side mesh pocket, the bag is an ideal companion for parents and the perfect successor to the diaper bag if the parents are on a short trip with the buggy in the city.